The preface of James Howard Kunstler's The City in Mind begins: "This book doesn't pretend to be the last word on cities." And throughout Kunstler's breadth of knowledge on architecture, history, sociology, psychology and anthropology he keeps this initial promise. 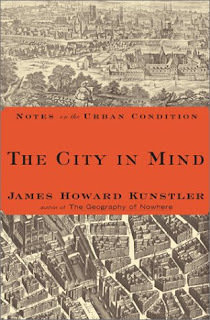 Kunstler's topic, surveying the functionality and representative value of eight world cities, though explored in his previous works (Geography of Nowhere , Home from Nowhere ) delves deeply into proponent arguments for New Urbanism while maintaining a vocabulary and style that is entertaining and accessible. I am neither a city planner, nor an architect in training and I was, save for a paragraph here and there, riveted by the historical contexts and philosophical arguments Kunstler poses. So riveted that for the last three weeks--as I've read the text on bus commutes--that I analyze the architecture and city structure in downtown Denver, and will plan on following up this review with thoughts on San Francisco in a couple of weeks. Anytime a text can get inside the head of a reader with such finesse it deserves applause. The City in Mind is an invaluably interactive text because it drives the reader to approach his space, his environment, with a philosophical microscope. Paris: Kunstler applauds the work of Napolean III and his prefect of the Seine (essentially a mayor/city planner) Georges Eugene Haussmann for their efforts to turn the city from rat infested slum to unified, human-sized municipality. Specific building guidelines were placed so that buildings in Paris resemble one another and knit a complete tapestry, rather than being a madly assembled mesh of different styles. Paris is this way, united physically, and by an excellent system of trains. "The next economy will be the Repo economy when, for example, amazing numbers of 'DiTech 125 percent Dream Loans' will be labeled nonperforming and seedy-looking men armed with repossession notices show up in the circular driveways of the defaulted-upon chipboard-and-vinyl McMansions in places like Cherokee County, Georgia, to change the locks on the putative collateral." Mexico City: A history lesson from the conquest of the Aztecs by the Spanish all the way to the present day crime-driven, collapsing, under-watered plateau city at the center of Mexico. Berlin: How can a city be rebuilt, ignoring its history with fascism and socialism, and knit itself back together from two halves that spent 40 years growing apart? Las Vegas: Ten-lane roadways, half-mile long city blocks, absurdly cheap casino hotels that are built to last only as long as their own novelty to the public and then torn down. Kunstler argues that a city predicated on getting something for nothing will never be built for real people, only for their boundless curiosity in vices. And some really amazing history on Howard Hughes great buy-up of much of the original downtown. Rome: This was a city, built massively, by hand! and without the aid of any machinery that still stands in great ruin, but nearly serviceable today. The buildings we make as humans today are never intended to remain for as long as those of Rome, where humans first pioneered the use of cement and concrete. Every inch was built with care and consideration, a detail that would impact architecture hundreds of years later, but would never fully sink in. Boston: Kunstler presents evidence that this one city has shown the capability to re-urbanize itself bit by bit (though not yet complete) to become functional for a society of human beings, not a society of cars. Gentrification, and massive transit projects heal not only the appearance of the city, but also mobilize the many populations to keep the urban organism alive. London: Parks! Big ones! The impact of our (borrowed from the English) American obsession with open space, and our fear that urbanization means only the dirty implications of the Industrial Revolution when times have long since changed. And of course, our "god-given right" to a large parcel of land to use without any concern for the public good or the greater value it adds to our community. Just snippets here, but what's amazing about The City in Mind is that Kunstler places convincing emphasis on the need for mixed-use footprints in building. Instead of having an office park, which goes from bustling to ghost town each and every day, a well designed group of commercial, residential, industrial and park space makes it livable for humans who would no longer need long commutes, unnecessary personal transportation and the like. Imagine, really, waking up, wherever you are, and being able to walk to a cafe, go to work, shop for groceries and anything else and then walk home, without ever considering stepping foot inside a car. If streets, city blocks, transit, and buildings are assembled so that people can use everything around them with ease, life could be less stressful, simpler and altogether more fulfilling. Instead, America now is established with all of the wealthiest people out far away from the city in a place where they MUST drive to the grocery store, MUST drive to shop, MUST drive to work and could walk for miles along endlessly winding suburban streets without finding anything but more people who have to do the same thing. And all of this, the driving, the cost of living, all of it, are increased by the establishment of distance. A well-run city, one with a diverse society of people of all classes can grow and mutate and shift as time demands without ever losing its essential value: a place for people to live. The City in Mind may not find mass appeal, but it has piqued a passion in me and is allowing me to see the city I live in, the quality of the buildings around me, and the way each city block is used much differently. Now, not only do I see something ugly in a dead, pay-for-parking lot, I also see a spot where something beautiful could go, an apartment building with basement parking, retail on the ground level, three floors of office space and 4 more floors of living space. Instead of leaving an ugly, empty husk every night, this would see service and value to its community all day long. And that's something. A world where no building had to be empty half of its standing life.